After I create a new output procedure requirement using VOFM transaction, I experienced following ABAP error when I transport new output routines to test systems. Although I could assign new output procedure requirements on NACE tcode screen using Procedures buttons, I see that the output determination does not use the new requirements. The output messages created for an invoice is not correctly determined by the output determination procedure. After I could set the problem, I started to search the source of the problem to come up with a solution. I created the requirements using the SAP VOFM transaction, and code in ABAP for additional requirement calls and for additional check for the invoice output. I already know from my previous experienced that the function groups should be activated manually and the object list should be build manually from the SE80 context menu to resolve similar issues. First of all, I opened the related function group in SE80 screen. 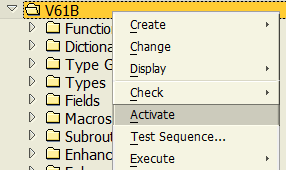 You can find the target function group using the Display Object List button or Ctrl+Shift+F5 short-cut when the ABAP source codes of the requirement routine is displayed on your screen. Right click on the function group. In my case the related SAP function group is V61B. From the context menu, follow Other Function > Rebuild Object List menu options. Up to now, I was successfull to correct such problems related with ABAP function groups but this time it was not possible to resolve this issue like this. For the solution, this time I had to execute ABAP report RV80HGEN. 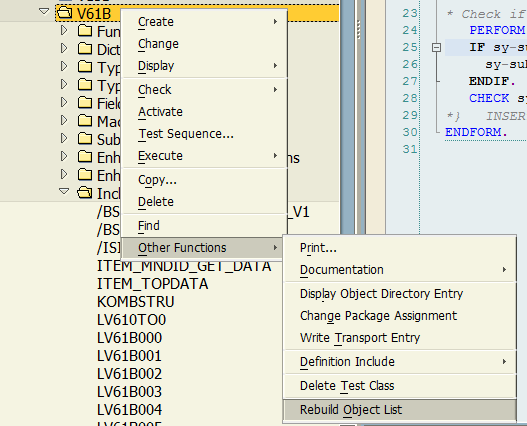 After you execute RV80HGEN ABAP program if you do not see the new include files and still get the "Main program for include RV61Bxxx not found" error message, try rebuilding the object list and activating function group manually. Doing these after RV80HGEN program execution will solve the problem.